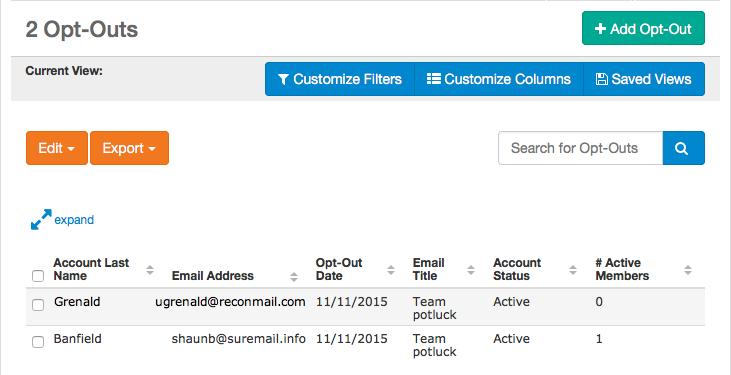 The Manage Opt-Outs tab lets you handle all aspects of those who have unsubscribed from team emails. If someone says they are no longer receiving emails from your team, this is one place to check in case they unsubscribed but want to get emails from you again. Go to the Email Center. Chameleon users: In the side menu click Team Admin > E-Mail Center. New CMS users: In the side menu click Team Tools > Email Center. Click the Manage Opt-Outs tab. Enter the email address to unsubscribe. The Customize Filters, Customize Columns, and Saved Views all behave exactly like those in Account/Member Admin to customize what you see. Use the Search for Opt-Outs field to find email addresses. The more letters you type, the more it filters out. Select one or more users. Click Export > Custom Excel Export. Select desired fields to include. It is not recommended to remove everyone from the unsubscribe list. They selected to unsubscribe for a reason and removing them from the unsubscribe list could irritate them. If the account is still Active we recommend giving them a call or speaking with them in person to find out why they no longer want emails from the program. You might find out they have one foot out the door and can encourage them to stay with the program. This can help with member retention. Use Customize Columns to add the Last In column to your view. If someone hasn't signed in for a long time, perhaps they are no longer with the team or they have one foot out the door. If they are still with the team, reach out to the family to see if you can draw them back in. If they are no longer with the team set the account status Suspended or Canceled/Hidden. For a meet update email only those on the Committed Athletes tab instead of the whole team. For job signup reminders send emails from the Job Signup system. How do I recover a Google Apps password? What is the maximum file size for email attachments? Communication: Do unverified email addresses and SMS numbers receive messages? How do I link to files in an email? How do I change a coach's email on coach page? How do I create a forward for one of my team branded email addresses in Google apps? How do I email job volunteers? Why didn't my invoices email? Why can Outlook receive but not send? How do I preview the password email? Do emails sent to primary email addresses get copied to the secondary email addresses? How Do I Send to All the Emails in Each Individual Account?